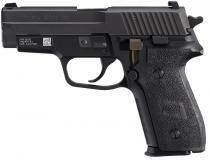 Sig Sauer P228 M11-a1 9mm 3.9"
The M11-A1 is trusted by elite military personnel, upgraded for you. Issued to US Naval Aviation and key units in every branch of the Armed Services, the M11 is proud to serve. Upgraded with a stainless steel slide and a short reset trigger, the M11-A1 variant features the same phosphate coated internals, Siglite night sights and Mil-Std UID label of the standard-issue M11. This model ships with three 15-round flush fit magazines.